You are here: Home / Arrival of the Black Rings! Hello everyone! My name is Klajdi, friends call me Clyde, and I'm a CardFighter from Brooklyn, New York. I started the game when it was pretty young, just as the 2 first trial decks were released. I accidentally stumbled upon it while I was reading some articles. I find the luck factor of this game interesting, the fact that one card can determine the winner and the loser makes it a game that will keep you on the edge of your seat for as long as you're playing it. My favorite clans are Link Joker and Narukami, because they fit my aggro/control style of play. Well, that's enough about me, let's jump right into the article! Introduction to the Clan/Article. If you have been following up with Season 3 of the Anime and the latest Japanese sets, the term "Black Ring" might sound very familiar. It's connected to the latest clan introduced to the game, Link Joker, who made its first appearance in TD11 and gathered further support in Sets 12 and 13. This clan is unique to the game because it brought a new mechanic called "Lock". Even though this clan still hasn't made its appearance in the English part of the game, I would like to discuss it for the English audiences because it has a high chance of being one of the clans who will define the upcoming Break Ride Meta, just like it has in Japan. In this article, I will give a brief description on the play style of this clan and talk about the 2 main units of the clan, "Star-Vader, Nebula Lord Dragon", and "Star-Vader, Chaos Breaker Dragon", who were introduced respectively in Sets 12 and 13. I will also share the personal deck lists I use for both of these units and explain my choices. Main Mechanic + Mr. Main Event. It would be ridiculous to talk about Link Joker without explaining what the ability "Lock" is. When a unit is locked, the whole Rearguard circle that the unit is on becomes unavailable until the end of your opponent's next turn. You cannot do anything to a locked unit, prime examples being retiring it to call another unit, intercepting with it if it's a Grade 2 and others. The targeted unit is nonexistent until the lock is lifted. Lock is accessible to Link Joker by skills mostly possessed by their Grade 3 units, with exceptions being the Grade 2 "Star-Vader, Mobius Breath Dragon". There are also other units who can activate their abilities if there is already a locked unit on the field, like one of the forerunners of the clan, "Star-Vader, Dust Tail Unicorn", who can CB1 to lock a Rearguard as long as there is already a locked unit on the field. Other units gain power every time a unit is locked, specifically the Grade 1 "Demonic Claw Star-Vader, Lanthanum" and the Grade 2 "Furious Claw Star-Vader, Niobiu", with the only condition being that they have to be on the field while the lock happens. There is though, one terrifying unit who makes the clan as consistent as it is, who opens up fearsome combos that if achieved, can put you in the driving seat for the win, as I will explain further when I explain the 2 deck lists. 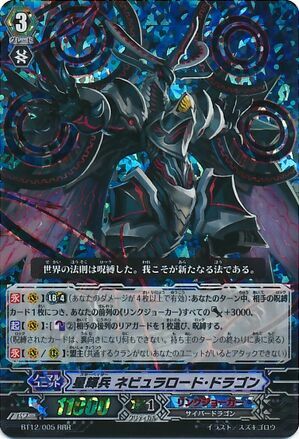 That unit is none other than "Star-Vader, Infinite Zero Dragon", the Break Ride unit of the clan introduced in TD11. If you Break Ride (perform a regular Ride on top this card card when you have 4 damage), you get to lock 2 units, one in the opponent's front and back rows. This means that during their next turn the opponent can only attack with one Rearguard column and a Vanguard without a booster. But it doesn't stop here, the 2 units locked by this effect can sway the game entirely to your favor if combined with the skills of the units you Break Ride over Infinite Zero. That might be through making ridiculous numbers to burn as much guard as you can from the opponent's hand, or by slowly gaining the advantage over your opponent by generating more advantage than he has, both strategies having in common also being able to stop their attacks and saving shield through the use of Lock. Play Style. The clan can be described as one with a defensive play style. By utilizing the "Lock" skill, when a front row unit is locked, that whole row is unable to attack during your opponent's next turn, while if a back row unit is locked, the front row unit in the same row will attack for less, making you save more shield. But what makes this clan frightening is the fact that they can also turn the locked units into attacking power. This way they will not only stop you from attacking but they will also attack for higher numbers, forcing more shield. I will go into more specifics for both Nebula Lord and Chaos Breaker. The way they are played is different from each other, so I will talk about their own play style as a deck and the way they interact with the other units in their deck, considering they both have different strategies to win a game, and require different units in order to do that, other than the standard combination with the Break Ride. The generalizations have been made, let's jump right into the specifics, first up, Nebula Lord Dragon! Nebula Lord has been my favorite unit since he was first releasedd in BT12, mostly because of his amazing art. Nebula Lord has 1 Non Limit Break [ACT] skill and his Limit Break skill. For his [ACT] skill you can CB2 to lock one unit in your opponent's back row. This skill is fairly ordinary and has a high cost, because Link Joker has no damage unflippers and to use this skill more than 2 times per game you have to rely on luck and hope you drive/damage check Heal triggers. But what makes Nebula Lord fearsome is his Limit Break. Nebula Lord will give the front row +3k power for EVERY locked unit on the field. Meaning your front row can gain 3k-15k and even more if specific units like Niobiu are in your front row. This skill will force 15k+/a Perfect Guard for every attack, not to mention the probability of getting trigger units on your Twin Drive. Below, let's see the deck list I use for Nebula Lord Dragon and explain everything you need to know about him and the deck, including the strategies when you are able/unable to Break Ride. Grade 0 - Details. I have always been a fan of using the 17/14/11/8 formation when I make my Vanguard decks, and I rarely change it except for when a specific deck needs a different formation. The trigger lineup is standard, the Criticals create a lot of pressure with the high number columns you are creating, while the Draws help you set up your field, which is incredibly important in Nebula Lord. The other pair of triggers is Heal, which can be considered standard in most decks and are very important. The starter we use for the deck is Unicorn, which is an amazing starter for the deck. His best use is in the late stages of the game, combined with Nebula Lord/Infinite Zero. He can CB1 to lock any Rearguard on the field, as long as the opponent has another locked Rearguard prior to you using Unicorn's skill. When used correctly, he can lock a unit in the front row, thus blocking an attack from the entire column during the next turn and saving you shield in the process. Grade 1 - Details. 4 Perfect Guards (Promethium) is considered a staple in most of today's decks. With most Vanguards reaching high amounts of attacking power, you need to completely block their attack, and to cut off their hopes of hitting with trigger power/effects being added to their attack. Perfect Guards take care of this, and that's why I believe you need it at 4, in order to have a higher chance of it reaching your hand and being safe from those turns where your opponent goes for a game ending push. Lanthanum is easily the best booster the clan has. He gains +2K power every time a unit is locked while he is also present on the field. With 1 locked unit, he can become a 9k booster, while with 2, he can become an 11k booster, and so on. The turn of the Break Ride, he becomes an 11k booster, and considering the front row units are powered up by Nebula Lord's Limit Break, you are going to hit for big numbers, going over 26k+ if the booster is Lanthanum. Running him at 4 is a must in every Link Joker deck. Neon is a "clone" of a new series of cards who have been introduced in the sets which have been a part of the Break Ride Meta. Basically, he is a 7K base unit, who gains +3K power when he attacks and there is a Vanguard with "Star-Vader" in his name, this making Neon attack for 10K. Nebula Lord is all about hitting high numbers, so Neon can be a front row Rearguard during the turn the Limit Break is active, since he is a 10K unboosted attacker, and ranging from 13K-19K with the Limit Break. He is also good in early game rushes, where his skill comes in handy because most times opponents do not wish to guard that early in the game. It's a win-win scenario, because they either take the damage, or they waste more guard early in the game. Last but not least, Aurora Eagle is one of the generic 6K +4K when a specific condition has been fulfilled Vanguard only boosters. In Aurora Eagle's case, he will gain the extra 4K of power when he boosts and you have more Rearguards than your opponent. Remembering what I said in the opening paragraphs of the article, a locked unit is considered nonexistent, thus making you automatically have more rearguards considering both you and your opponent's fields are full. In the turn the Break Ride happens, you are guaranteed to have more Rearguards than your opponent, thus gaining the 4K boost and making your Vanguard climb up the ladder of Magic Numbers. I have seen people use Palladium in this deck, which in my opinion doesn't go well with Nebula Lord's high cost for his non Limit Break skill, considering Palladium requires a CB1. His skill is amazing, as it can block an entire row from attacking yet another turn, but it goes against the focus of Nebula Lord, which is to finish the opponent before he has a chance of being unlocked again. We will see how deadly Palladium is when we talk about Chaos Breaker Dragon. Grade 2 - Details. Neon has a Grade 2 version, Radon. He has a 9K base and gains +3K when he attacks and you have a Vanguard with "Star-Vader" in it's name. He is one of the cards who enables the high numbers in the deck. With one locked card, he will attack for 15k unboosted, while with 2 locked cards he will attack for 18k unboosted. He is best used in the situations when you are unable to Break Ride, and your purpose is to get him and Lanthanum in the same Row in order to hit 21k+. But when you do Break Ride, he is simply amazing, he is one of the main "culprits" who can make those 26K rows sound so easy, and one of the units you have to be careful when you put on the field, because most opponents know how dangerous he is and will try to attack and retire him. Neon isn't the only one with a Grade 2 version. Even Lanthanum, our favorite booster, has a Grade 2 version, in the form of Niobiu. Niobiu is simply amazing. If you manage to have her on the field prior to the Break Ride, you are pretty much guaranteed to have a 26K+ attacking column. From the Break Ride, you get 2 locked units, hence making Niobiu gain +4K from hew own skill. She is now at 13K. While at the same time, she will gain another +6K from Nebula Lord's Limit Break, making her a 19K UNBOOSTED unit. The fun doesn't stop here though, during the same turn, you will lock another unit with either Unicorn or Nebula Lord's non Limit Break skill. The number will go from 19K unboosted, to 24K unboosted ( an extra 2K from her own skill and an extra 3K from Nebula Lord's Limit Break). Niobiu is easily the best G2 in the deck, and it's usually the unit who gives the 6th damage to the opponent, considering that with a boost, she may even reach 31K+, not counting trigger power/effects that may be passed on to her from the Vanguard's drive checks. The last Grade 2 unit I will discuss, and a pretty controversial choice, is Fenrir. Fenrir is a Grade 2 unit with 8K base power, who gains +3K when he attacks and your Vanguard is one that has a Limit Break 4 skill. Considering both of our Grade 3 units have a Limit Break 4 skill, he will always get the +3k attacking boost starting from turn 3 until the end of the game (considering no grade locks happen). The reason I chose Fenrir over Krypton, the vanilla 10k, is because of multiple scenarios. First off, the majority of Vanguards in the Break Ride format are 11k. An unboosted Krypton can't hit them, while an unboosted Fenrir can. The other scenario, is when you aren't able to Break Ride. Considering Nebula Lord is very dependent on its Break Ride in order to win, you have to be able to deal even with the less favorable scenarios, for example, when you do not Break Ride. Excluding the Vanguard specific booster and the Perfect Guard, 8 of the decks boosters are 7k. Meaning, with one locked unit and an active Nebula Lord Limit Break, Fenrir will hit for [8K + 3K Skill + 3K Limit Break + a 7K boost] 21K, which is able to force 15K worth of shield from the majority of the formats Vanguards, while Krypton will only hit for 20K, which only needs a 10K shield to be completely blocked as an attack. You have to be prepared for everything, hence my decision to run this card. You can run Krypton just as fine though, as I have tried out both versions and succeeded, Fenrir is just a personal preference of mine. If you run Krypton, make sure to have Lanthanums on the field prior to the lock though, so you don't end up hitting lower numbers. Grade 3 - Details/Main Combo. After explaining the units who benefit from the main combo, it's about time to talk about the 2 stars. This combo is easily one of my favorites, because as explained earlier, not only will you lower your opponent's attacking options during his next turn, you will also hit Magic Numbers, and quite hefty ones. Infinite Zero Dragon is a winning condition for this deck, the win is so much easier if you manage to Break Ride over him. The 2 units that he locks, combined with Nebula Lord's Limit Break, will give +6k to your front row, and even more when the units in the front row are the ones I mentioned in the above paragraph about the deck's Grade 2's, or even the Grade 1 Lanthanum. This combo will make for 2 turns of high powered attacks, let's break both turns down. In Turn 1, the Break Ride is triggered, hence locking one unit in the front and back rows on your opponent's field. Then, you can choose to lock an extra unit with Unicorn, or Nebula Lord's non Limit Break skill. By using Unicorn, you can lock the unit in the other front row, thus making the opponent run out of options and being only able to attack with an unboosted Vanguard the next turn. It is HIGHLY recommended to completely guard the unboosted Vanguard's attack, leaving it with enough guard so 2 triggers can make the attack go through is unacceptable and a foolish move. Considering that an unboosted Vanguard is the only attacking option your opponent has, he will pitch all trigger power/effects into that attack, and you don't want to throw away your win for a foolish mistake like that. Personally, I would rather use Nebula Lord's non Limit Break skill to CB2 and lock a unit in the opponent's back row, leaving him with only a front row and unboosted Vanguard attack. I will explain this decision in the Turn 2 explanation. After your opponent's next end phase, he will have wasted a considerable amount of shield, because your front row gained 9K (+ bonuses from specific units) in attack power, and this turn should be the one where you finish him off. On the explanation of Turn 1, I said how you should lock a unit in the back row with Nebula Lord, and I will explain why. When you do it the traditional way, by using the 2 units locked by Infinite Zero and Unicorn, you completely block the opponent other than the unboosted Vanguard himself, but during Turn 2, you are only left with the option of locking 2 back row units with Nebula Lord, thus the opponent has all 3 rows available to attack, even though not at full power. If you save Unicorn for Turn 2 instead, you can block a whole row from attacking, along with locking the Vanguard booster for another turn through Nebula Lord. This is all happening while your front row is also gaining 6K (+ bonuses from specific units). By the end of the second turn, your opponent should be at 6 damage, and you should have won the game, unless his hand was at double figures, which even then, is depleted quickly by this deadly combo. But things won't always go the way you want to, and there are games when you are unable to Break Ride over Infinite Zero Dragon, and you are left t with Nebula Lord Dragon. Nebula Lord is not that great of a stand alone Vanguard, and you have to be really careful when you are stuck with him. Here, I will explain the 2 turns you should aim for when you miss the Break Ride. You miss the Break Ride. It's not the end of the world, you can still make it, even though it is largely more difficult to win in this situation. In Turn 1, you simply try to lock a back row with Nebula Lord, the one you think is more problematic than the others, it could be the Vanguard's booster, it could be anything. It will still give your front row +3K, and don't forget you have Radon/Niobiu/Fenrir who will get the bonus power, meaning you will still make 21k+ rows, meaning you will still force guard from your opponent. The only difference is that it will be harder for you to defend during your opponent's turn because they have a field at nearly full power to attack you. You survived the previous turn, now it's time to really dish out the large numbers. There is possibly 3 CB's left, so it's time for Unicorn to step in the spotlight. You use Nebula and Unicorn to lock 2 units, 1 in the front and back rows, and the action starts now, because you can finally begin to make those 26k rows you thought you were so far away when you missed the Break Ride. Go all out on this turn, because if your opponent survives this, you might be in for some trouble because you will be sitting on a Vanilla deck for the rest of the game! This is it for Nebula Lord Dragon, I hope you liked the deck list and my own personal deviation from the traditional strategy I have seen other Link Joker players use. Now, it is time to move on to the next boss, Chaos Breaker Dragon! Chaos Breaker Dragon(CBD) is the second Link Joker main boss unit released, being a part of BT13. The Link Joker version containing Chaos Breaker Dragon in it has absolutely dominated the Japanese Meta since it's release, and to no surprise, this card has one of the most powerful Limit Breaks in the game, and when combined with the skills of the other units in the deck it can create deadly combos where the opponent finds it difficult, to some extent nearly impossible, to escape and try to win. Chaos Breaker Dragon also has 2 skills, his non Limit Break [ACT] skill and his Limit Break. Just like Nebula Lord, his non Limit Break [ACT] skill is used to lock a unit. In Chaos Breaker's case, you discard 1 "Star-Vader" and also CB 1 "Star-Vader" to lock any Rearguard on the field. This skill is more practical than Nebula Lord's because you can lock a front row Rearguard every turn, limiting your opponent to 2 attacks. His Limit Break skill is why this unit is so feared, explaining its dominance so far. During the opponent's End Phase, when his units are being unlocked, you can pay the cost of SB1 to retire those units, and ALSO draw one card for each retired unit. This cost can be paid more than once, meaning you can retire up to as many units as your Soul allows you too. This skill generates a lot of pluses, and it is hard to recover from for your opponent. Below, let's see my personal Chaos Breaker deck list and explain my choices. Grade 0 - Details. Like I said in the Nebula Lord deck list analysis, I am a fan of the 17/14/11/8 formation and I am using the same one for the Chaos Breaker Dragon build. The trigger lineup is also the same, but if Link Joker had a third set of critical triggers, I would be tempted to take 2-4 Draw Triggers out in order to replace them with Critical Triggers. The reason is that the deck achieves a lot of drawing power through Chaos Breaker Dragon's Limit Break, so replacing the Draw Triggers with Critical Triggers would be a good choice in my opinion, but for now, this lineup remains, and it is a good one regardless. The starter is also Unicorn, just like in the Nebula Lord build. He is in my eyes the best starter Link Joker currently has, and his combination with Chaos Breaker Dragon is very powerful, because together they will lock the 2 front row Rearguards, thus stopping 2 attacks during your opponent's next turn. Grade 1 - Details. There isn't much chance to the Grade 1 lineup, but there are 2 changes, 1 of them which I think is very important to the consistency and efficiency of the deck. Promethium is the clan's Perfect Guard, and being such he needs to be in your hand at all times, that being the reason, he will always be at 4. It was explained how important Lanthanum was to the clan, being a booster that can be powered up by locking your opponent's units, but he takes a far greater importance in the Chaos Breaker Build. Considering Chaos Breaker Dragon won't power up your front row units like Nebula Lord, you need to find a way to still hit those Magic Numbers and hit 21K+. Here is where Lanthanum is the star, because he, along with other units like Radon/Niobiu will enable those Magic Numbers. What makes him even more consistent is the fact that a certain Grade 2 unit can Superior Call him, which we will look into when we discuss our Grade 2 in detail. In the opening sentence of the paragraph, I talked about a Grade 1 which is incredibly important to the deck, and that is none other than Palladium. Palladium's skill activates at the same time as Chaos Breaker's, when an opponent's unit is being unlocked. Palladium can CB1 to go into the soul and keep that unit locked for another turn. It's a powerful skill, because it can keep a front row unit locked for another turn, thus stopping the unit from attacking for another turn. But what makes it scary is the combo with Chaos Breaker Dragon itself. Since both the skills activate at the same time, if you re-lock a unit with Palladium first, that unit can't be retired with Chaos Breaker Dragon's skill, but since the unit was previously unlocked that turn you can pay the cost of SB1 to draw 1 card from your deck (you can even SB the same Palladium that went into the soul). This combo is one of the main combos of the deck and it's a powerful one that keeps you in control of the game for a longer time. For Nebula Lord, we talked about the 6K+4K Vanguard specific booster Aurora Eagle, but Chaos Beat Dragon is a tad different. There are also other units who are 6K base, and need a cost of SB1 when boosting to boost a specific Vanguard for an extra 5K power, but in Chaos Beat Dragon's case, when he boosts Chaos Breaker Dragon, he doesn't need to SB1, all he needs is a locked unit on the opponent's side of the field when he is boosting. What's even better is that this skill also works on a Chaos Breaker Dragon in a Rearguard circle, making you hit 22K with that attacking row. If your personal preference is to run 15 Grade 1's, you can run 3 of Chaos Beat Dragon. Grade 2 - Details. Chaos Breaker Dragon fails to power up your front row units like Nebula Lord does, so that's where units like Niobiu and Radon come in handy. Niobiu will be 13K unboosted the turn of the Break Ride and 15K unboosted when combined with a single lock from Chaos Breaker Dragon/Unicorn, so that is enough to hit 21K with a simple boost. The real "hero" here is Radon. Just like in Nebula Lord, you must try your best to pair him up with Lanthanum, because even with one lock, these 2 combined together will hit 21K, hitting the majority, if not all of the Vanguards in the Break Ride Meta. The opponent will know that his Rearguards won't be available for long, so they will try to take yours out while they are still able to do so. You have to be careful on the timing in which you play these two units. Getting Lanthanum in your back row is very important, and you have to rely on luck of the draw/triggers to be able to reach to him, but with this new addition to your Grade 2 lineup, you are able to superior call Lanthanum. This unit is Colony Maker. For a pathetic CB1, she is able to superior call a Grade 1 or lower Link Joker from your deck, the only requirement being that there has to be a locked unit on your opponent's side of the field, that being the reason I am only running her at 2. Locked units are available most of the time in the late stages of the game, and having more of her would mean you risk getting her early on. More would also be a waste of CB, and less wouldn't add to the consistency the deck needs in order to get Lanthanum/Palladium to the field. The final Grade 2 I run is 1 Krypton, the only reason being that I want him as a ride option if I get him early , and since Chaos Breaker Dragon doesn't have high numbers as a priority, I don't prefer running the [8K+3K] cards like Fenrir or Pulsar Bear. Grade 3 - Details/Main Combo. We mentioned before that Nebula Lord is highly dependent on the Break Ride. Chaos Breaker Dragon is a near surefire victory if you Break Ride him over Infinite Zero, but he can also stand his own when you don't Break Ride. There is no "number of turns" you HAVE to win in for Chaos Breaker Dragon, instead, you slowly torture your helpless opponent until his resources give in and the advantage you have amassed is greater than his. Below, let's explore the scenarios, if, and if you don't Break Ride. If you managed to Break Ride, in my eyes, you are guaranteed a victory. You will lock one unit in your opponent's front and back rows, and you can choose to lock the one in their other front row with either CBD/Unicorn. I would rather use Chaos Breaker Dragon's skill, so that when your opponent re-calls front row rearguards, you can lock both of them again (considering the two that were locked the turn before were retired by Chaos Breaker Dragon's Limit Break). During your opponent's next end phase, after he has only attacked with an unboosted Vanguard, you activated your Limit Break, you retire up to 3, and you draw up to 3. That is simply lethal, and can decide the flow of the game. You keep using Chaos Breaker Dragon's skill to block attacks and retire/draw until your opponent is out of resources. Do not forget that you will also aim to hit 21K+ with Radon/Niobiu + Lanthanum or a Rearguard column of Chaos Breaker Dragon/Chaos Beat Dragon. Running out of soul is not a problem, since you have your Grade 1/2/3 from the Riding itself, not to mention Unicorn and Palladium who go in the soul in order to activate. You can also ride one CBD on top of the other one. If you didn't Break Ride with Nebula Lord, you had to be very careful and think out your attacking columns/which unit to lock very carefully. Considering he locks a back row unit, the opponent could still attack with his front row unit, even though with not as much power as if it was boosted.He can still do damage to your important Rearguards, or even the Vanguard if that unit can attack for 11K+ by itself. But Chaos Breaker Dragon can lock a front row unit, meaning he can stop Rearguard attacks early in the game. You can lock a unit while you are at 3 damage, and your opponent can get you to 4 during your next turn. If your opponent does this, the Limit Break will activate, retiring 1/2 and drawing 1/2. Your opponent may choose to attack your Rearguards in order to stop the LB from happening, but you can force it to happen by leaving no Rearguards on the field so the opponent is forced to attack your Vanguard. If they decide not to attack at all and to skip their single/twin drive, their loss, you will just re-lock the units during your next turn and force him to attack your Vanguard again. The winning scenario is the same, you simply gain more advantage than your opponent, while also destroying his resources. This is the high and mighty Chaos Breaker Dragon, probably the most sadistic unit in Cardfight!! Vanguard! Behind that breathtaking art also lies a powerful skill, and it is no joke that this deck has been dominating! I have been talking for Link Joker in a way that makes them sound invincible so far, but that is absolutely not true! I have been outlining the combos that make them such a frightening clan, but it is possible to stop this clan, even though it's not as easy.Below, lets underline some of the ways you can make this clan less effective! Link Joker is highly dependent on it's Break Ride, Infinite Zero Dragon. When me, and many other experienced players see Infinite Zero Dragon sitting on the opponent's Vanguard circle, we try to delay it's Limit Break, meaning we try to attack the opponent's Rearguards so we can dwindle their resources. This works very well against Nebula Lord, because he needs his front row Rearguards to reach those high numbers, and attacking them can seriously cripple his powerful Limit Break ability! On the other hand, this strategy is more difficult vs Chaos Breaker Dragon, because he may leave no Rearguards and force you to attack him. You are obviously not going to stop attacking for that turn and skip your Twin Drive. Even if you get him at 4 and you keep attacking his Rearguards, he can easily replace them with the draw power he receives from Chaos Breaker Dragon's Limit Break. As a bottom line, you have to be very careful on your resources. You can also rush your opponent early game. If you can get him to 3-4 damage before the Break Ride, they will have to think twice on their strategies, because you risk attacking multiple times early in the game during your next turn too. This is a very effective strategy on Link Joker, but it can also backfire unless you do it effectively. If your opponent manages to resist your continuous early game attacks, your field will be full of Rearguards to lock, and his damage will be at 4, meaning he can activate his powerful skills and combos. Again, timing and resources are key! There are also certain clans/builds that can counter Link Joker really well. The prime example is Spike Brothers. They do not leave Rearguards on the field for Link Joker to lock, making it very hard for the deck to make all of it's plays. Other builds, like Majesty Lord Blaster, can threaten the opponent with a passive 2 Critical. You can leave the opponent at 3 Damage, and threaten him with a 2 Critical Majesty Lord Blaster, while also attacking their Rearguards with yours. Another example is the Dimension Police Clan. The strategy is the same, you leave your opponent at 3 Damage while constantly threatening him with multiple critical units, like Daiyusha/Great Daiyusha, and even by the use of the Clan's Break Ride, DaiKaiser. This is it! After this long journey into the clan, I have to conclude this article! It has been a blast writing about your favorite units and your favorite clan, and I would do it again if I ever received the chance. I would like to thank ARG for giving every player an opportunity to write about the game, and I would also like to thank my 2 friends Ross and Justin who have helped me test these 2 builds and the clan in general , without their help I wouldn't have been able to write such a detailed explanation! Until next time, Stand up, the, Vanguard! Born and raised in Europe, but recently moved to Brooklyn, New York. Have been a fan of many TCG's, including MTG and YGO. Cardfight!! Vanguard is the current TCG I am focusing on, and it has been really fun so far, and I am expecting more fun in the upcoming sets. this article is amazing. way to go, and keep up the good work. Hope to see more from you. This is a great article. I’ve been playing Link Joker since they’re announcement, I know the clan inside and out. But this article enlightened me to a few new concepts, the breakdown of the different playstyles in the clan helped me with both my Nebula Lord and Chaos Breaker decks, I’m looking forward to more articles (hopefully) from Klajdi. This is a very well written article. Clear, Concise statements. You obviously know what you’re talking about and just about all of the information is understandable even to a new player like myself. Very well written. I’m extremely new to the game, but this clan gives me something to look forward too. Compared to the other articles, this one sets the bar for all else. If the rest of the community could come close to meeting this standard, the support for the game could grow exponentially! This is the best Vanguard article that has been written so far, and I have been an avid reader of all of them since their release. THIS is the standard by which all articles should be measured. Keep up the good work!! I feel like we should expect to see you do a number of deck profiles or clan analyses (which I think we definitely need more of for the benefit of the newer or younger players). Keep up the good work, and I hope my suggestions get passed along. really great and in depth article. l personally like chaos breaker more than nebula (both effect and art, though art is wonderful bothways) simply for the consistency of the deck and the difference in depending on the br. chaos sadist is so damn powerful. beating you through defense…. I had no idea of Link Joker since I quit but this was very instructive. Nice read, I liked it, I hope to read more from you Kladji. Great article man! I like the analsys you give for your decisions in terms of card selection and why certain things work with the deck. I look forward to your next article! First off, great article! I have been playing Link Joker myself and they seem like a powerful clan while still being really defensive, but I found myself losing more than I thought I should be. You have great insight about what the clans weaknesses and strengths are, and this article taught me a lot for sure. I look forward to your next article man!